This giant blueberry Pop-Tart slab pie is the stuff of childhood dreams. This thing truly tastes like a Pop-Tart, with a sugary blueberry filling and a crisp and buttery crust. Plus, it’s topped with a delicious sweet icing with rainbow sprinkles. To begin, whisk together the flour, salt, and sugar in a large mixing bowl. Add the cold butter-flavored shortening in pieces to the mixture and combine using a pastry blender. Next, slice the cold butter into one-inch pieces and add to the mixture in three batches. Combine using a pastry blender until the mixture looks like cornmeal. Fill a glass measuring cup up to the ½ cup mark with cold water, then add in a few ice cubes until the water reaches the ¾ cup mark. Slowly add a little bit of water at a time to the dry mixture, using a wooden spoon to stir it into the ingredients as you go. Use all of the water, but do not let the ice cubes fall into the bowl. Then, dump the mixture out onto a lightly-floured surface and begin kneading it into a ball. At this point, you may have to add a little bit more cold water to the mixture to get it to form into a ball, but be careful to only add a tiny bit. Use a dough cutter or a knife to then cut the ball of dough in half, making one piece slightly bigger than the other. Then, use your hands to push down on each piece of dough and form them into discs that are about an inch thick. Wrap each piece individually in plastic wrap and place in the fridge for at least three hours. In a medium sized mixing bowl, use a spoon to combine the jam, sugar, corn starch, and lemon juice. Be sure that you do not get any seeds from the lemon into the mixture. After at least three hours have passed, remove the slightly bigger piece of dough from the fridge. Let rest for 15 minutes. In the meantime, get out your 9x13” baking sheet and parchment paper. Line the baking sheet with the parchment paper and make folds or creases along all of the edges. Lightly flour a clean surface, unwrap the bigger pieces of dough, and place it on the counter. At this point you can remove the smaller piece of dough from the fridge and set it aside. Use a rolling pin to begin rolling out the larger piece of dough. You want it to fit nicely in the pan with about an inch or two left over around all sides for the crust. Once you’re on track with the shape of the dough, remove the parchment paper from the baking sheet and place it on the counter. Then, transport the crust dough onto the parchment paper to guide you. Continue rolling out the dough until it is the correct shape and size. Then, place the parchment paper with the dough back onto the baking sheet. Next, add the blueberry filling. 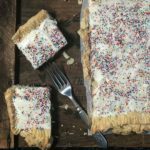 Simply pour it out into the baking sheet and use the back of a spoon to spread it evenly throughout the Pop-Tart. This is also a good time to preheat your oven to 375 degrees. With the filling in place, it’s time to roll out the top piece of dough. Again, lightly flour a clean surface and begin rolling it out to be 9x13”. This piece does not need the one to two inches extra around the edges like the bigger piece did. When the top piece is ready, carefully pick it up off your countertop and place it on top of the bottom piece and the filling. Use your fingers to crimp all of the edges together. Then, use a fork to make marks all around the crust. Finally, use that same fork to poke holes in the top of the dough, making three rows of about a dozen fork marks. Now this thing is really starting to look like a Pop-Tart! In a medium-sized mixing bowl, melt the butter in the microwave. Then, add the powdered sugar, milk, and vanilla extract. Whisk to combine. Your giant Pop-Tart is complete! Cut it into square pieces to serve and enjoy!